Although General Burgoyne was a British soldier and not under the American colors at all, the quilt which some way is associated with his name would be really effective in red, navy and white. A Burgoyne block is composed of a number of smaller units, four patches, nine patches, plains and an odd oblong six patch. Put together according to the plan shown they form a beautiful pattern 15 inches square if seams are added to the cutting units given. 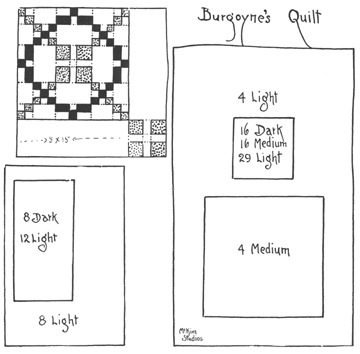 Twenty blocks set together with light strips 5 inches wide with a pieced block of medium and light at the corners and bordered with the same makes a quilt top about 85 by 105 which makes a quilt long enough to fold over the pillows to form a spread. 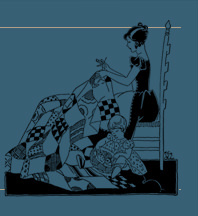 Material Estimate: This quilt takes 20 pieced blocks set together with 49 strips 5 by 15 inches and 30 small pieced 5-inch squares. It will require 1 yard of dark material, 2 1/4 yards medium and 6 yards of light, a total of 8 1/4 yards which includes material for setting together.